Pink's Boutique - Try Me Gift Sets 2 for £25.00 (normally £40!) Spas around the UK will be hosting special offers too during Organic Beauty Festival...check here for locations. More details on the gifts sets coming up on Wednesday. Botanicals are celebrating 10 years and during OBW will be offering a special Limited Edition Gift Box worth £47.95 for just £27.95 (save £20!). The trial-size collection contains five of Botanicals all-time favourite, award-winning products. It also includes a £5 money-off voucher for your next purchase! Green People have a special offer everyday this week along with free delivery throughout September! Tuesday 9th: Soft Buff Exfoliator - £5 off! Suti are holding two events at Suti Head Offices where they will be offering free mini treatments and with every purchase of Suti products, they will give a free Suti Trial Pack worth £9.00. These are at 10am-5pm on 18th September and 25th September at The Rosary Barn, Ketches Lane, Sheffield Park, Uckfield, East Sussex, TN22 3RY. Thursday 4th September - Suzannah Jenkins of Suti will be offering free mini-facials and reflexology treatments at Big Life Organics, 112 South Road, Haywards Heath, West Sussex RH16 4LL - please call to book - 01444628667. 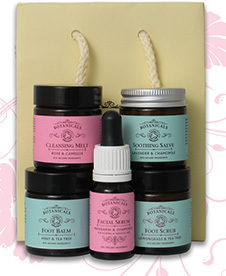 SoukSouk have launched a Limited Edition Beauty Box available on their website in Septmeber for just £22.00 plus P&P. The box includes brands such as Balm Balm, Nourish and Skin Blossom! GLOSSYBOX: To help celebrate Organic Beauty Week, GLOSSYBOX has teamed up with the Soil Association to bring you an organic edit of beauty treats worth £50. The limited edition Organic Box contains five beauty must-haves with products including Bamford Geranium Body Wash, Odylique Rose Cleanser, Essential Care Herbal Shampoo, Neal’s Yard Remedies Lipstick and Pai Camelia & Rose Gentle Hydrating Cleanser. The limited edition Organic Beauty GLOSSYBOX is available for £15 from today! Therapi: The award-winning Soil Association certified British beauty brand will be teaming up with Bamford Haybarn Spa to offer customers a chance to meet the bees at Daylesford Organic Farm in the Cotswolds at 2pm on Saturday 13th September as part of their Organic Beauty Week activities. The 90 minute session entitled ‘Secrets & Sweetness of the Bees’ will be a rare chance for anyone fascinated by the medicinal uses of honey to find out more about its unique properties and a chance to come face-to-face with the great alchemists who make this liquid gold – the honeybees themselves! This sounds absolutely amazing...I wish I could go! I have a Therapi Honey Skincare review coming up this week on Friday so keep an eye out for that. Therapi are going to be selling their products direct from their own website too and are celebrating by offering a 20% discount...use the code ORGANIC14 for the whole of September! Neal’s Yard Remedies: With the largest range of Soil Association certified products, Neal’s Yard Remedies will be actively promoting Organic Beauty Week through a series of special shopping events, promotions and social media activities. Through the NYR Organic Consultants, and in store, Neal’s Yard Remedies will also be previewing a NEW certified organic, and clinically proven age defying serum during September: Frankincense Intense Concentrate. PukkaHerbs: Pukka believe that inner health and wellbeing is essential to looking good on the outside, and believe that this starts with feeling great on the inside. As many of us look to alternatives to boost our wellbeing and help us to maintain our hectic lifestyles, Pukka want to help people do this in the most natural ways possible: by turning people on to the magic of herbs. They will be offering 25% off their Vitalise Powder; the hero for everyday family! Check out my post from yesterday featuring some of their teas in yummy cocktails! Odylique/Essential Care: They will be hosting a live web chat, all about organic on their Twitter @EssentialCareUK on Thursday 11th September at 7pm. They are also offering a FREE trial size Toning Fruit Butter and free delivery using the code SEPTFREE. GreenScents: The first cleaning products brand to be certified by the Soil Association. Peter has given my readers a special discount of 15% off when you buy 4 or more products. Use the discount code GREEN1 at the checkout. Vital Touch & Circaroma: Both brands will be hosting offers & discounts on their website. Natalia by Vital Touch is a unique brand of organic and natural products for pregnancy, labour & birth so if you have any pregnant friends who need pampering...you know where you go! Circaroma will have a whopping 25% off their Skin Balancing and Skin Gentle Facial ranges for this week only! Nourish will be offering 20% discount from 7am Tuesday 9th September til midnight Wednesday 10th September using the code ORGANIC. They have also just launched their new Kale Enzymatic Exfoliating Cleanser (review coming soon!) and you can get a free toner (worth £11!) when you buy the cleanser...use code KALE. (from 15th September to 30th September). Lulu & Boo are offering 15% off their products throughout Organic Beauty Week and will have another offer the week after so keep an eye out! Whole Foods Market: Whole Foods is the leading natural and organic retailer in the UK. Whole Foods Market is a proud contributor to the Soil Association’s Organic Beauty Week. In addition to organic demonstrations every day in every store, they will be hosting a series of in store events including:10th September 6pm-9pm: All nine UK stores will host ‘An evening of organic bubbles & beauty.’ Enjoy a complimentary glass of organic Prosecco and a free organic beauty treatment. I'll be popping along on 10th September to their Kensington store so keep an eye out for a vlog of the day! 12th - 14th September: Whole Foods Market Kensington will be hosting a pop up ‘Green Room’ featuring samples, demos, workshops & inspirational talks and all UK stores will offer 20% off all organic health & beauty products in an exclusive, one off event. LoveLula.com: For over ten years the Natural and Organic Beauty website LoveLula.com has retailed Soil Association certified products and actively supported the organic cause. LoveLula will support Organic Beauty Week with offers, promotions and competitions all relating to products that are certified by the Soil Association. Sophia's Choice: Stocking a wide variety of natural and organic products, they will be offering 15% discount on all orders placed this week! Adore Naturals are offering 10% discount throughout September and will be having new offers every week! Naturisimo are offering up to 20% off Soil Association products and a free Therapi Lip Nectar with orders over £30 using the code ORGANIC. Lucy Rose have lots of special offers on their website but as a special Organic Beauty Week offer, they're giving you a free 6-piece Sample sachet set from Inlight when you buy any Inlight products! There you have it! The lovely girls over at Call it Vanity have some other codes too that I was checking out today including an awesome one for Content...head on over there here. Oh man, I wish the Souk Souk and Glossybox were available to the US!